Spay & Neuter Event: In addition to helping to curb overpopulation, spaying and neutering also offers health benefits. Spaying helps prevent uterine infections and breast tumors, which are malignant or cancerous in about 50 percent of dogs and 90 percent of cats. Spaying your pet before her first heat offers the best protection from these diseases. Neutering your male companion prevents testicular cancer and some prostate problems. Spay & Neuter Event: If you weren't able to take advantage of our Spay & Neuter Event in January, make sure you bring your pet in February! Obesity Awareness Month: As a concerned pet owner, you need to understand that your pet's weight is one of the most influential factors of longevity, quality of life, and disease prevention. We are dedicated to providing you with the tools needed to trim excess weight from your pet and improving their health. Enter your pet in our Weight Loss Challenge which runs from March 1 to April 30. Pet Identification Month: Losing a pet can be a pet owner's worst nightmare. Implanting your pet with a microchip can give you the peace of mind that if your pet were to ever become lost, they could quickly be identified and you can be contacted. With the purchase of a microchip you will be entered into our draw for great prizes! Mental Health Awareness: So what happens when our pets get bored? If we don't keep them mentally stimulated pet's will come up with their own ways to pass the time, and you’re probably not going to like their idea of a good time! During the month of May we showcase products which help to beat boredom as well as educating clients on what they can do to keep their pets busy. Emergency Preparedness Month: Emergencies happen at the most inconvenient of times and places and it is important that pet owners are prepared for dealing with these emergencies. As the weather warms up pet owners may be taking their pets camping, or horses trail riding where veterinary aid is not readily available. During the month of June we focus on educating clients on Emergency First Aid, and the importance of having a Pet First Aid Kit and Emergency Pack for both small and large animals. Customer Appreciation Month Visit us in July to enter our Client Appreciation Draw and have a chance to win some awesome prizes from some of our suppliers. We will be hosting a Customer Appreciation BBQ for all of our valued clients Friday13th 11am - 1pm. Come by for hamburgers, drinks and snacks. We greatly APPRECIATE ALL of our clients - We wouldn't be here without your continued support! Dental Awareness Month: Dental disease is more than just a cosmetic issue — when your canine companion or feline friend has red gums, yellow teeth and stinky breath, it could be a sign of dental disease that could, if left untreated, lead to devastating affects on your pet’s quality of life. Neglecting your pet’s teeth and gums can cause chronic pain issues that may even be at the center of certain behavioral problems. 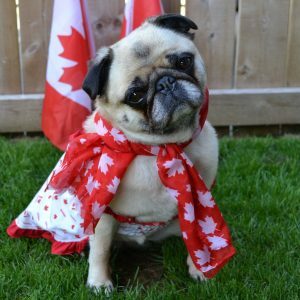 Senior Mobility & Arthritis Awareness Month With the weather turning colder, now is the perfect time to address your senior pet's mobility and arthritis issues so that you and your pet can spring pain free into warmer weather when it arrives! October is dedicated to raising awareness for animal arthritis, how pets can be affected, and what treatment and preventative approaches can be made to help alleviate and prevent the pain associated with ageing. Howl-oween! : Come into the clinic on October 31 with your pet in costume to be entered into our Howloween draw! We also have a Halloween coloring contest for kids available all month long. Tails of Help Alberta Challenge: Tails of Help is an Alberta-based charitable organization which funds essential veterinary care for ill or injured pets. 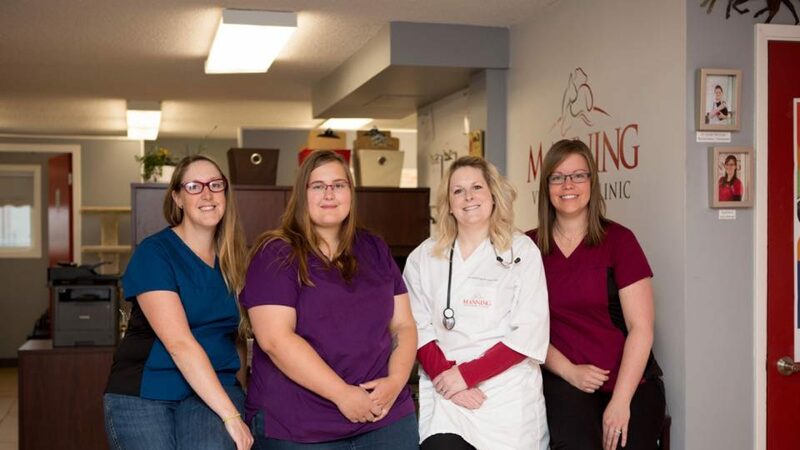 This important charity makes $1000 available to Manning Veterinary Clinic. During the month of November we join the Tails of Help fundraising campaign to raise funds for this important charity. Pet Pictures with Santa (date to be decided): bring your pet(s) into the clinic to have their picture taken with Santa!